DALLAS - A deadly storm that has caused flooding and coated parts of the southern Plains in ice during the Thanksgiving holiday weekend dumped more rain on already swollen rivers in parts of North Texas and Arkansas on Sunday and made driving dangerous in parts of Oklahoma. The band of storms that has been moving through parts of the Plains and the Midwest since Thursday has been blamed for at least 14 deaths, including eight in Texas and six in Kansas. Oklahoma Governor Mary Fallin today declared a state of emergency on Sunday due to the storm. "Nearly 100,000 homes were still without power Sunday afternoon as a result of freezing rain, ice and sleet that began Thursday," Fallin's office said in a statement. The Oklahoma Department of Transportation said roads in the Panhandle remained slick after the slow-moving storm dropped ice and freezing rain in the region. Utilities in Oklahoma said the ice storms helped cut power to more than 78,000 as of Sunday morning. 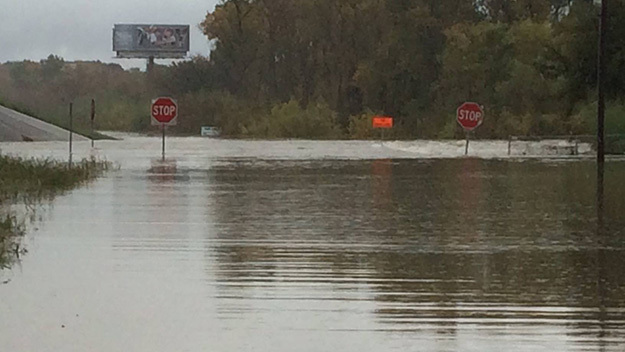 In parts of North Texas and Arkansas, the concern was flooding, with flood watches and warnings in effect through Sunday evening. A 70-year-old woman whose car was swept away in Fort Worth on Friday remained missing Sunday. Authorities had planned to send in divers to search for her, but rushing waters made recovery efforts too dangerous and difficult, Fort Worth Fire Department spokesman Kyle Clay said. Flooding also resulted in a family having to be rescued from their home in Seagoville, southeast of Dallas. Three people and a dog were rescued from the home. Four other families chose to leave because of rising waters from a nearby creek, said Melinda Urbina, Dallas County Sheriff's Department spokeswoman. River waters also lapped at the foundations of homes in Horseshoe Bend community in Parker County. Joel Kertok, the emergency management spokesman for the county west of Fort Worth, said the river there crested and had begun to recede Sunday as the rain diminished. "We have some water that came right up to the homes," he said. "We were close." In Texas, the areas of most concern sat near the swollen Trinity and Brazos rivers. Most of the rain was expected to taper off by Sunday night, but there remained a chance for showers into Monday, said Matt Bishop, a meteorologist with the National Weather Service in Fort Worth.